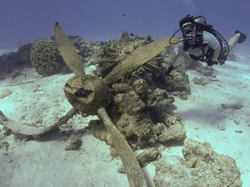 Task Force Dagger Foundation partners with East Carolina University's Maritime Studies Program to explore and research WWII sites in the western Pacific. For more information about Task Force Dagger visit https://www.taskforcedagger.org/. For more information about the WWII Maritime Heritage Trail visit http://www.pacificmaritimeheritagetrail.com/.